Gate House Wood Touring Park is located at Wrotham Heath, 2 miles east of Wrotham Village. Take the M20, travelling west. At Jn 3, take the M26 spur, then within 1/2 mile take the Jn 2A turn off. At the roundabout take the first exit (A20 southbound (signposted Paddock Wood)) onto London Road. Turn left onto Sandy Lane, then turn left into Ford Lane. The site entrance is on your left (see map). From the west take the M26, Jn 2A turn off. At the roundabout take the third exit (A20 southbound (signposted Paddock Wood)) onto London Road. Turn left onto Sandy Lane, then turn left into Ford Lane. The site entrance is on your left (see map). Take the M20, travelling west. Take the M20, Jn 2 turn off. Follow the A20 southbound to Wrotham Heath, then follow the map as before. Number 70 bus can be caught at the railway station every hour. It takes only 7 minutes to 'The Royal Oak' pub at Wrotham Green. 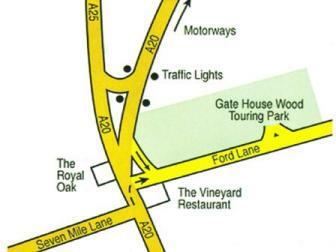 Gate House Wood Touring Park is only a 5-10 minute walk away (see map).